IT WAS difficult to find a seat - even in the last row of Epidavros' theatre - for the final performance of the 2006 Hellenic Festival on August 5. 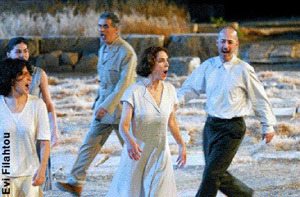 On a hot, still night, the classic Sophocles' tragedy Antigone was presented to over 10,000 people at the ancient Argolid amphitheatre. Director Lefteris Voyiatzis, who also appeared in the play as King of Thebes Creon, gave the 440BC story a late 1940s texture. Set and costume designer Chloe Obolensky stripped down the stage to reveal only the ground-level ancient rocks interspersed with yellow hay and the amphitheatre's bare circle of dirt. The sun-like lighting was warm and natural. The same could be said for Nikos Panagiotopoulos' modern Greek translation, which Voyiatzis occasionally even invested with comedy. From the start, a hush descended onto the amphitheatre as The New Stage troupe started to circle the stage - occasionally leaping into each other's arms - in what resembled a swirling warmup. The men wore trousers and loose shirts, the women, girlish, calf-length, flowing dresses. Before long, the crowd fell silently under the spell of actress Amalia Moutoussi who, as the adamant Antigone, kept her character's fiery conviction at 100 percent throughout the lengthy performance. Fighting to bury her brother Polyneices in defiance of law, Moutoussi entirely avoided a classical delivery. Instead, the adrenaline-filled voice of this on-the-edge Antigone - as she argued with sister Ismene (Evi Saoulidou) or uncle Creon - can easily be heard on today's Athens streets after some horrible crime, accident or injustice. Moutoussi's voice carried into the highest tiers as her Antigone proclaimed: "The only thing that pains me is my mother's unburied son. Nothing else causes me pain." Unfortunately, Voyiatzis' Creon could not match Antigone's strength. His stage presence was lacking and it was hard to hear him in the highest seats when he turned his back. Popular actor Nikos Kouris played Creon's son Haemon, while, in an unexplained move, the blind prophet Teiresias was played by a woman (Stephania Goulioti) and Creon's wife Euridice by a man (Nicolas Papayannis). The play "soundtrack" consisted of the troupe's constant wordless singing. Sometimes the secondary characters were sympathetic listeners, other times they became an angry mob. The movement was unstylised and flowing. Antigone closed a rejuvenated Hellenic Festival, under its new director Giorgos Loukos. The 2006 Athens and Epidavros festival programme was marked by a shorter season and an expanded number of Athens venues (including the new Pireos 260 and Scholeion spaces).